Savannah Cleaning Systems is located in Savannah, GA. Visit our showroom to learn more about our Pressure Washers, Waste Water Recycling, Automatic Parts Washers, Detergents, Parts and Service. 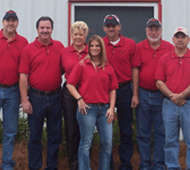 We are an authorized dealer for Hotsy and Landa for the entire southeast and lower area of South Carolina. We are here to provide professional service, repair, and consultation to local businesses and private contractors along the Golden Isles Coast. We service such accounts as Georgia Ports, Interstate Paper, International Paper, Local and State Government, Container Companies, Local and State Government, Hospitality, Private Contractors and so many more businesses that need pressure washing equipment. Please contact us and learn what countless others have – we value your business and want to prove it! We are a GSA Contractor for Hotsy, Landa Kärcher Group and Cuda Kärcher Group equipment! Directions: Located at 1390 Dean Forest Road (Georgia Highway 307) and I-16 East to Savannah. Need help? Give us a call at 312-233-0659 or complete the form below and we'll respond as soon as possible. Copyright © 2019 Savannah Cleaning Systems | All Rights Reserved.